(Server) Create a session using your Private API key including the amount, currency and description. (Client) Initiate a Transfer from your website using the session created earlier with your Public API key. (Client) Customer completes the Transfer. Authentication and request parameters are described in API Reference. 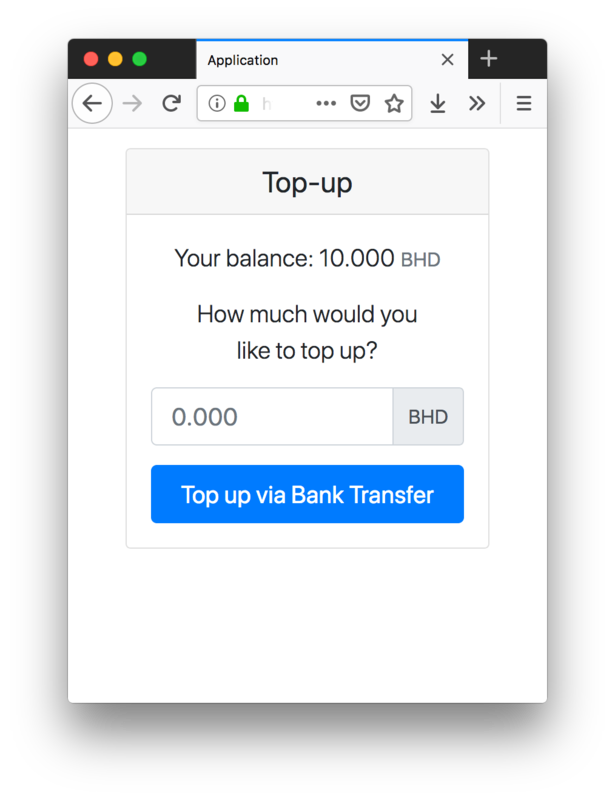 When your customer clicks the 'Pay' button, a popup is loaded inside an iframe that allows the user to complete the Transfer. When the transfer is processed, the onComplete callback is called with a Transfer object parameter. Make sure to validate the Transfer on your server. Only `Transfer` objects with status `succeeded` should be considered successful. 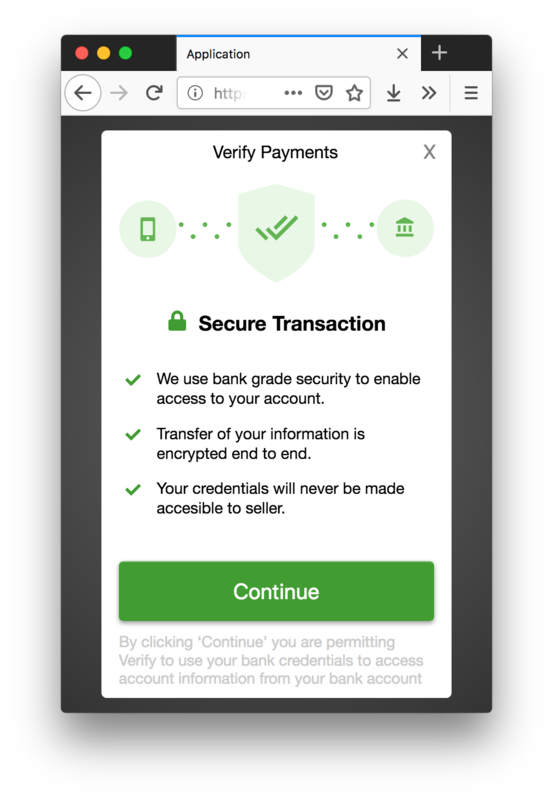 If you need any help integrating Verify Payments, let us know. 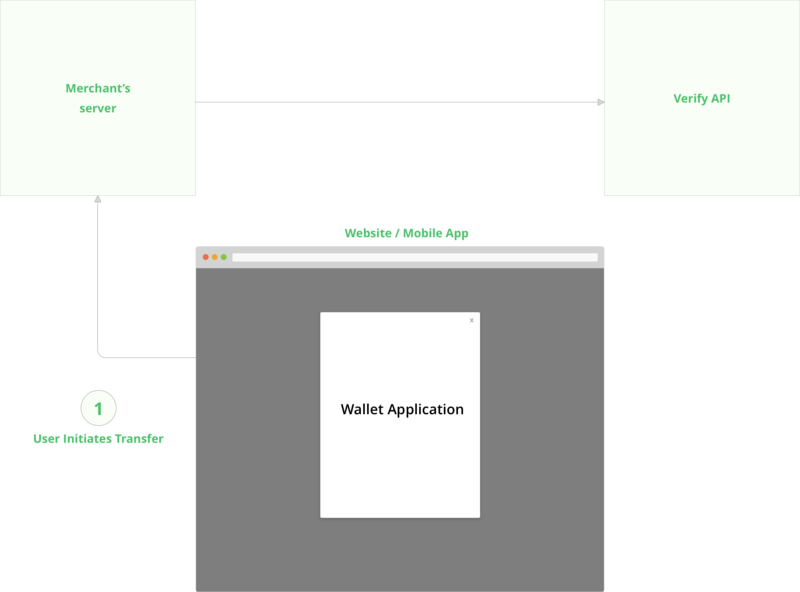 The following guide uses pseudo mobile wallet as an example appliction. It describes all steps and interactions between user, application, backend and Verify API when user top-up his wallet. Full source code of the demo application can be found in our Github repository. Front-end part is located at ./public directory. Back-end part starts from ./index.js in the root directory. 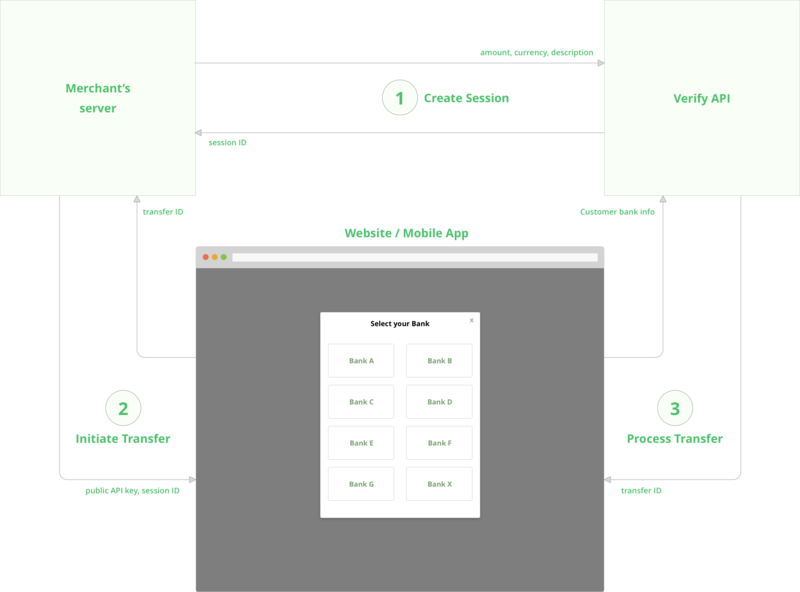 For the simplicity reasons we skip validation and error handling in many places of the demo application. You should carefully handle all such cases in your production application. verifySDK is a simple HTTP client for Verify Payments API. You can find the source code of this client here. As result of this code our application receives sessionId. When transfer is completed SDK calls onComplete method and pass ID of completed transfer. In our case it's finalizeTopUp. 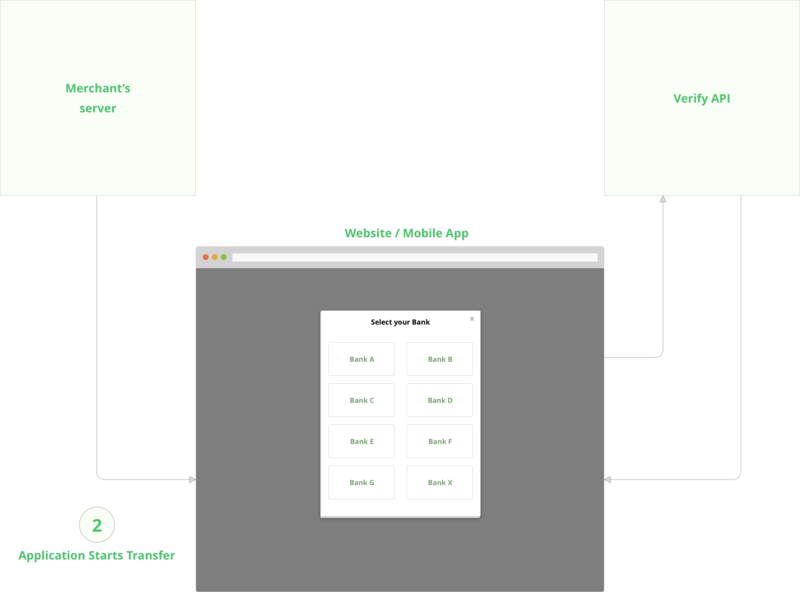 At the final step we have to update our back-end and show corresponding screen to the user. You can find installation, configuration and usage instructions in the iOS SDK GitHub repository. You can find installation, configuration and usage instructions in the Android SDK GitHub repository. You can authenticate requests to the Verify Payments API by including an API key in the request that you send. Every account (whether Test or Live) has a pair of API keys: secret and public. Heads up — Never use your secret key in any public environments including client-side web apps or mobile applications. It should only be used in direct server-to-server calls. We tried to make it easy to distinguish test API Keys from live ones and secret from private. Here is how. Each API key has a prefix sk or pk which means secret key or public key. Also, each API key contains the word live or test. If your API key looks like this: pk_test_aPx0PtQprQ... it's a public test API key. If it looks like this sk_live_dQODRGgH... it's a secret key of a live account. Contact us to get your API keys for test or live account. Thoroughly test your integration before going live using test information provided below. Inside VerifyPayments you have a Test Account which lets you test your integration. Test Account works with a Test Bank. So, all transactions are imitated and you can perform testing without being worred about real money. We would be glad to help you with any questions. Just let us know if you need any help at team@verify.as.